I was born and spent much of my youth in Chile, where I first felt the draw of the mountains. I guess having the Andes right in my backyard might have had something to do with it? I’ve worked for Mountain Trip for years, and have led 10 Denali expeditions for them. I’ve also guided Aconcagua the same number of times, and have led Mountain Trip teams up Mount Vinson a couple of times as well. I guide in the Tetons after Denali season, and have been spending my winters in southwest Colorado, where I guide ice and am refining my ski skills. 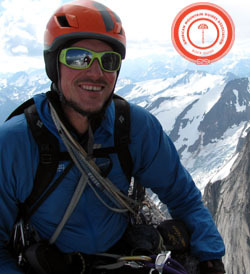 I have been pursuing becoming an AMGA/IFMGA Guide and currently hold an AMGA Rock Guide Certification. I’m close to taking my Alpine exam and started the Ski Guide discipline courses in the winter of 2015.